Union Station on Broadway celebrated a recent transformation with the public. 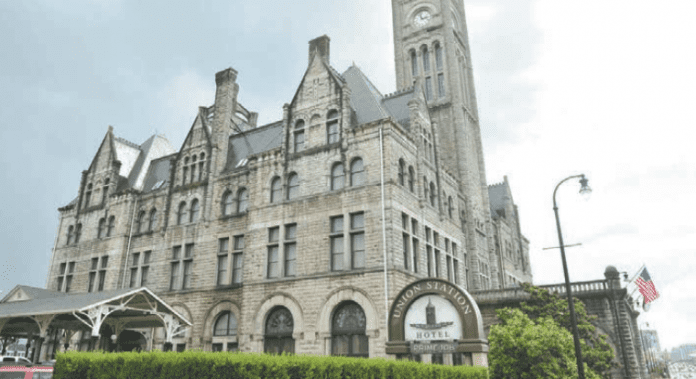 NASHVILLE, TN — Union Station Hotel Nashville and Historic Nashville, Inc. recently held “History Transformed, Welcome Back to Union Station,” a celebration of the hotel’s recent transformation. Following an extensive restoration touching nearly every area of Union Station, the hotel was excited to officially reveal its updates and new spaces for the first time to the public. The event fell on the 116th anniversary of Union Station opening in 1900. Hosted in collaboration with Historic Nashville, Inc., Music City’s only non-profit organization dedicated to historic preservation that was itself instrumental in preserving Union Station, the event included tours of the hotel’s updated rooms and events spaces, brunch bites and beverages provided by Union Station’s new bar and restaurant Carter’s, a silent auction and more. Historic Nashville, Inc., Metro Nashville Historic Commission, and the Tennessee Historical Commission, three entities dedicated to historic preservation and instrumental in the preservation of Union Station, were also on hand. Additionally, Historic Nashville along with Metro Nashville Historical Commission celebrated the announcement of the 2016 Nashville Nine, which was revealed directly prior to the event. A list compiled each year through a public nomination, the Nashville Nine reveals nine historic properties endangered by demolition, neglect or development and has included past properties such as the historic RCA Studio A on Music Row, Highland Heights School in East Nashville and the Tennessee State Prison.